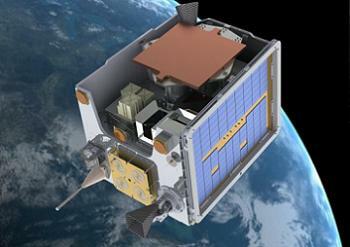 An innovative UK satellite has been confirmed for a late 2013 launch on a Soyuz rocket. Led by Surrey Satellite Technology Limited (SSTL), TechDemoSat-1 (TDS-1) is an impressive box of tricks that will carry eight experimental payloads into space, including the ability to end its own life at the end of its technology demonstration mission. The agreement – between SSTL and Glavkosmos / NPO Lavotchkin for the launch of TDS-1 – will see the impressive spacecraft hitch a ride alongside numerous passengers set for launch on the Soyuz when it lift-off from the Baikonur Cosmodrome in Kazakhstan later this year. The vehicle will be the Soyuz-2-1B rocket with Fregat-M upper stage, carrying its primary payload – the Russian meteorogical satellite Meteor-M2 – from launch pad 31/6. The 150kg TechDemoSat-1 – part-funded through the Technology Strategy Board (TSB) and South East England Development Agency (SEEDA) – will enable UK industry and academia to qualify onboard payloads and UK satellite software, thereby overcoming the problem of a lack of in orbit flight heritage that often becomes a major barrier to commercial success in the space industry. It is hoped that successful demonstration of the satellites payloads, in operational conditions, will provide the springboard for future technology contracts for UK industry and research partners. Based on the SSTL-150 heritage satellite platform, developed for the Rapid Eye mission (built under contract to MacDonald Dettwiler Associates), the platform has been modified to carry its cargo of eight experimental payloads. TDS-1 will provide on orbit testing of the new SSTL subsystem designs. The payloads include SSTL’s Sea State Payload (SSP) that will demonstrate how GPS signals reflected off the ocean’s surface can be used to determine ocean roughness and help maritime shipping plan more efficient routes. MuREM, a miniature radiation environment and effects monitor, is being supplied by the Surrey Space Centre, while the Charged Particle Spectrometer (ChaPS) – a radiation detector that can perform simultaneous electron-ion detection – was developed by the Mullard Space Science Laboratory (MSSL). Also riding onboard the spacecraft is the Langton Ultimate Cosmic ray Intensity Detector (LUCID), a detector that can characterise the energy, type, intensity and directionality of high energy particles. This was developed by the Langton Star Centre, part of a sixth form college, and is an element of a broader outreach activity supported by the industrial partners. Rutherford Appleton Laboratory and Imperial College are supplying the The Highly Miniaturised Radiation Monitor (HMRM), while the laboratory are also involved with the Compact Modular Sounder (CMS) system, an infrared remote sensing radiometer unit, in collaboration with Oxford University’s Planetary Group. 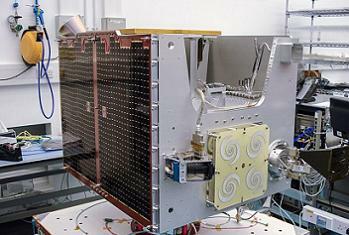 SSBV’s CubeSAT ACS payload, will provide 3-axes attitude determination and control, while a de-orbit sail, designed by Cranfield University, will be the last payload to be operated on TDS-1, ending the spacecraft’s life by sending the spacecraft to a destructive re-entry in the Earth’s atmosphere at the end of its mission. “TechDemoSat-1 is the first in-orbit satellite project directly funded by the Technology Strategy Board,” noted Tim Just, Head of Space at the Technology Strategy Board. “This hugely exciting and anticipated development will provide true space flight heritage to a number of new ideas and companies. 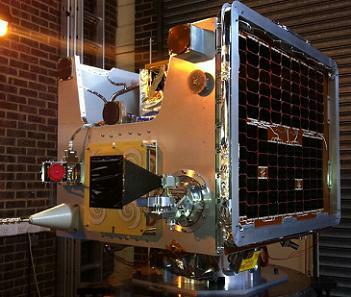 According to SSTL – who continue to be a trailblazer for the UK’s growing influence in the space industry – an enhanced on board computer will provide greater ability to conduct software experiments remotely, while TDS-1 will sport a new battery charge regulator and newly qualified cell types on two of the solar panels. The propulsion system will utilize a smaller tank size, trialled with a new high performance resistojet thruster along with new sun sensors in the Altitude and Orbital Control System (AOCS), adding increased accuracy to the previous sensors used.